The view from my workplace. Joli paysage bucolique. Je préfère la première photo. Mary MacADNski: I was playing around with the second. It seems the rains have come, Mary...all is green and lush. In the bottom pic, is there a bloke exercising a Pacer? Mary MacADNski: Very observant, Ray, about the sulky driver and pacer. I planned on explaining this (and naming it) but have run out of time. Mary MacADNski: Thank you, Richard. This id the view from my workplace. Mary MacADNski: Spring on the island is always compared to Ireland by visitors - very green. Pity about the dead one Mary. Mary MacADNski: The photos show four (five counting the pacer) different horses. They are dropping like flies. Mary MacADNski: It is my workplace view. Horses everywhere in that area. Mary MacADNski: They have horses for many purposes. This year I am watching old horses that the people take in for their last years. This is a lovely view to look at from your workplace. For a few years back in the 80's.I looked out on a large lake, it was very calming at times of stress. 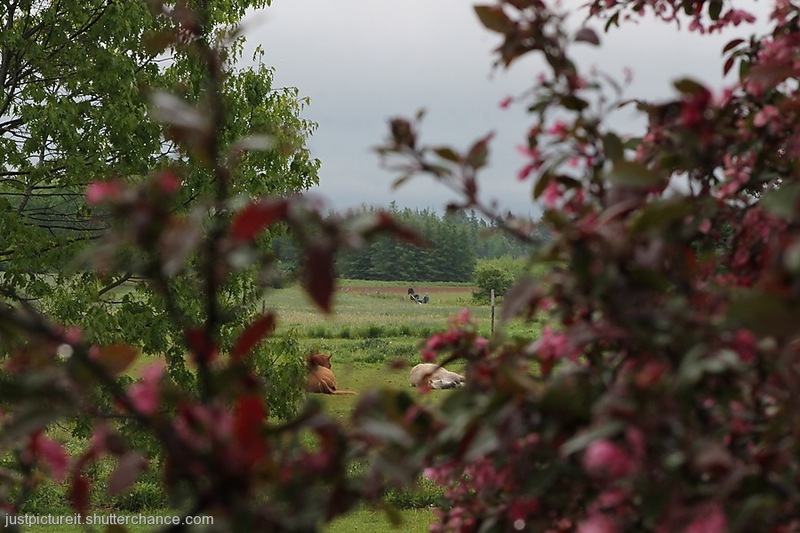 Mary MacADNski: I am so lucky to get most often country views. How lovely to be able to look out on that while you work Mary. Mary MacADNski: It is a true pleasure. Mary MacADNski: I certainly am. Different horses all the time as the neighbours have an operation using different types of horses. This year I am watching retirees. Mary MacADNski: I sometimes look out hospital/institution windows. They look like tranquil surroundings, Mary. Very lovely, Mary ! So nice to be able to look out and see this - it must be so calming! Mary MacADNski: It is really wonderful. I always have a camera but a better one in summer.